Parsley is cold hardy and will be productive year-round. It comes in both curly and flat-leaved (Italian) varieties. It is a biennial, meaning it will send up a flower stalk after its first winter, so it is best to set out fresh transplants every spring. 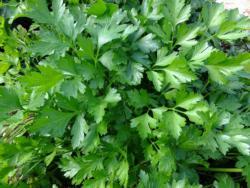 When to plant: Parsley seeds are slow to germinate, so allow for 9 weeks from seeds to transplant. Plant transplants Feb–May. Harvest window: Pick continuously throughout the growing season. Care overview: In hot situations, parsley will appreciate a bit of afternoon shade.